The sales representatives here at Ringo Hill are always ready to make you sure get exactly what you need. Click Here to contact a sales reps who wants to make you’re buying experience with Ringo a great one! The service department here at Ringo Hill Farms realizes that down time costs you money. That is why they strive to get you up and running again as quickly as possible. Do you have a problem or a question about a piece of equipment, trailer, or truck bed? Click Here to contact our service department. The office staff at Ringo Hill are always friendly and happy to help you with anything you might need their assistance. Whether it be a question on and order, or a billing issue, they are there to help you. Click Here to contact one of our office staff member. 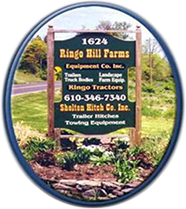 The Shipping department at Ringo Hill Farms is always there when you need them. Questions or concerns about your order should be direct to them. Click Here to contact one of our shipping persons.